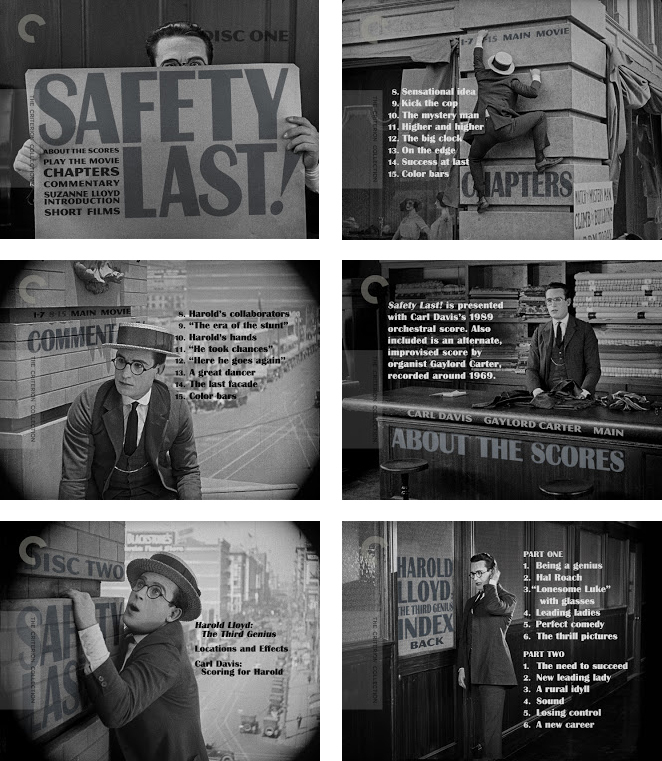 These are some of the menu designs I created for the Criterion Collection edition of Harold Lloyd's Safety Last! I don't think you can help but ask during the movie's building climbing, clock dangling climax, "is that for real?". The answer to the question is more surprising and nuanced than one might expect. Even the film's plot even gets pretty meta on the subject. What's not revealed in the story is amply and rewardingly so in the generous supplements for the release. For the DVD menus as well as the packaging I looked to inject some reality tweaking into the design by building the type into the shots. Coming to a theater near you! My poster design for the Janus Films release of the great Harold Lloyd's Safety Last! Not coincidentally based on my cover artwork for The Criterion Collection's release (in June) of the very same. It's a PACKED disc lots of fun and illumninating extras, plus some Llyod shorts which I believe have never before been available for home video. It's a good one.